jaaadesign » SEO » What is Structured Data? The findability of your website (SEO) plays a big role in the success of your business. Jaaadesign is a front runner in implementing extensive Structured Data: RDFa, Microdata and the relatively new Schema.org and JSON-LD, a summary. What is Structured Data? In essence they create communication between search engines (and other user agents) and your website: they explain the meaning behind words and structure. By adding ‘tags’ to the content search engines will have a much more detailed picture of what is presented, and your website will therefor be better matched to the target audience. In the same way one can (amongst many more) markup articles, offers and products, you’ll understand that relating your content in great detail is of incredible value to the findability of your website. The ‘breadcrumbs’ markup (above in green) is also the result of Structured Data. It goes without saying that making your website stand out in search results by adding relevant information is a very effective way to attract more (and quality) traffic. There are different forms of Structured Data (semantic languages) developed: RDFa, Microdata and the newer JSON-LD and each search engine has their own preference. Some 5 years ago Google, Bing, Yandex and Yahoo! came together in a attempt to create uniformity and schema.org came into existence. It represents a growing set of agreements and vocabulary and it makes use of all languages. 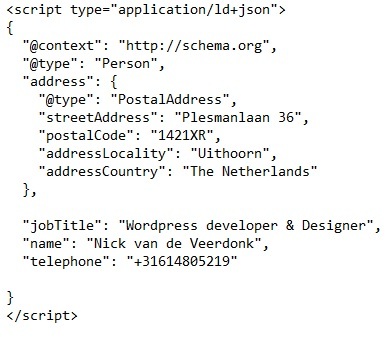 In reality the use of RDFa and Microdata is not easy: it costs time to learn and has to be implemented/interwoven into the actual content.To simplify the process JSON-LD has been developed that is capable to add Structured Data using a simplified code that can be implemented apart from the content, for example in the head section of the page. To get an idea what the results are of an extensive implementation of Structured Data, we recommend the article ‘Schema.org: worth the effort?‘.